Heng Yin Lau was one of Hong Kong’s most well-known Western-style restaurants in the late 19th century. It served as a favourite meeting place for Dr Sun Yat-sen and his friends to discuss the national affairs. Heng Yin Lau was one of Hong Kong’s most well-known Western-style restaurants in the late 19th century. Situated at the intersection of Lyndhurst Terrace and Pottinger Street, it served as a favourite meeting place for Dr Sun Yat-sen and his friends to discuss the national affairs while he was studying medicine. 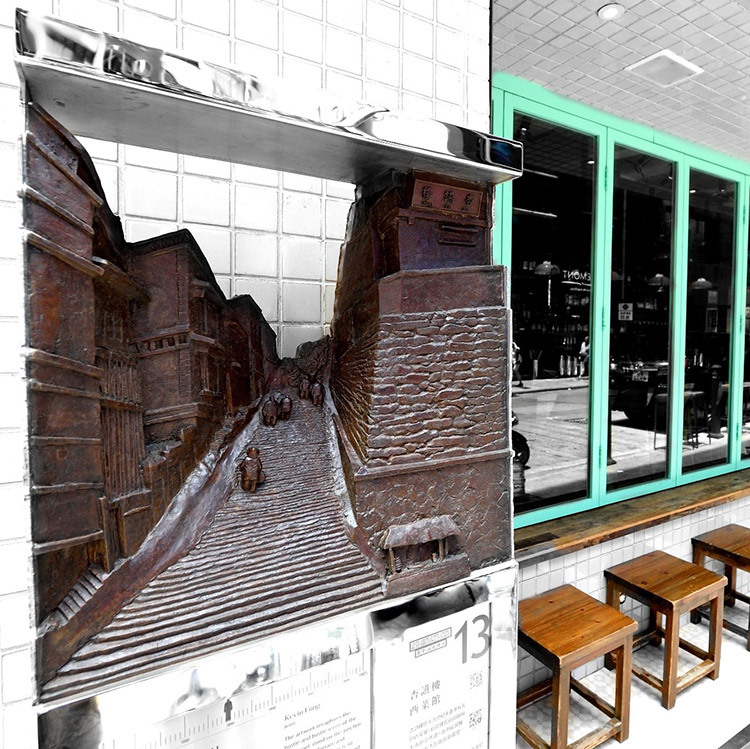 The artwork recaptures the hustle and bustle scene of the restaurant stood on the junction of Lyndhurst Terrace and Pottinger Street. There is no documentation on the style and outlook of the restaurant’s architecture. The artwork is the artist’s imaginary representation. Kevin Fung is a renowned sculptor in Hong Kong. Before devoting fully to his art, Kevin had been a telecommunication engineer for over twenty years. He obtained the Diploma of Contemporary Sculpture from HKU SPACE in 1993. His works were selected in the Hong Kong Art Biennial Exhibition (2005) and he received the Honorable Prize of Hong Kong Arts Centre 30th Anniversary Award in 2008. Kevin participated in numerous local and overseas exhibitions and public art projects. His works are currently on display in many public spaces.